Here at Heart of Silver you will find a large selection of Italian modular charms , sterling silver and Italian stainless steel jewelry. 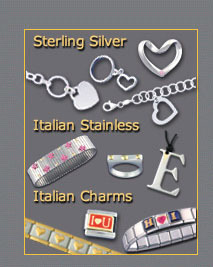 We pride ourselves in offering high quality genuine sterling silver and authentic Italian modular charms and jewelry. Begin browsing the site by choosing from the yellow tabs at the top. Then you can choose a category from the yellow bar below the tabs. Some sections will have additional choices on the left side. Products are added daily, so check back often and enjoy! !